We’ve talked before about how to find Flickr photographs you can use on your website or blog, with a number of good online tools that search Flickr for Creative Commons-licensed images based on tags or keywords. But here’s another (more colorful) way to go about finding the pictures you need: search by color! 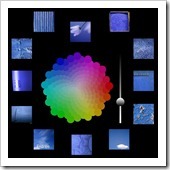 Why use a color-based image search tool? Sometimes a search by words – tags – just won’t cut it, especially when your search criteria’s likely to be almost entirely visual. Sometimes, it’s the color that counts. If you need a picture you can use for your website header, for example, the color of the image may be more important than the subject matter. Perhaps you just need an abstract image to use a background for a sidebar button or banner – a word-based search may not be the most efficient way to find a suitable image. Blog posts on a holiday theme, too, may call for illustrations with a particular color or combination of colors. And there can be an added bonus to using a visual search tool. Just switching your focus from words to images can help you to generate fresh ideas, by bringing a different part of your brain into the game. Multicolr Search Lab is a project of Idée Inc., a company that develops advanced image recognition and visual search software. This free web-based tool lets you browse through 10 million of Flickr’s most 'interesting' Creative Commons images to find ones that contain the colors you choose. When you first land on the Multicolor Search Lab page, it will be blank. 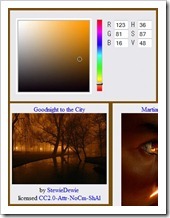 Just click on a color from the color palette to get started. The search results will show up as a beautiful mosaic of thumbnail photographs. Add up to 10 colors (or choose the same color more than once to increase its prominence in the found images). Your search results will automatically update as you add or remove colors from your selection. To see the original image on Flickr (opens in a new window), just click on any thumbnail image. Colr Pickr richly deserves a mention off the top, here, although its search is not restricted to Creative Commons-licensed images, so you’ll have to check for copyright status under “Additional Information” on each photograph’s Flickr page (click on a thumbnail to get there). 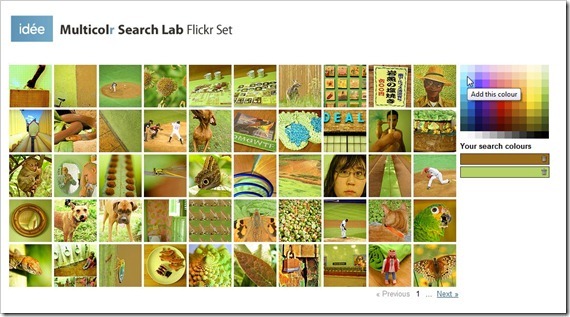 Colr Pickr was developed by Jim Bumgardner, co-author of Flickr Hacks (O’Reilly Media, 2006). You can only select one color at a time and will get fewer search results than with Multicolr, but this is still a great tool for exploring Flickr. In addition to the default “Color Fields” search, do try some of the other “groups” – see the links below the Colr Pickr – including Flowers, Crayon Box, Graffiti, Macro, Textures, Urban Decay, Catchy Colors, and more. Last but not least, Flickr Commons by Colour by Australian web designer and developer Paul Hagon lets you search the Flickr Commons for images from “the world’s public photograph collections” that have been contributed by libraries, museums, archives, and other cultural institutions. (These are not images licensed by their creators under the Creative Commons, but rather older images for which the participating institutions have determined there’s “no known copyright.”) Start your search by selecting a color, then refine it with the RGB sliders, and, if you like, use the range slider to include or exclude “near matches” and adjust the number of search results. Check out the four color-based search tools we’ve rounded up here, and let us what works best for you. Just don’t be too surprised if your productivity goes downhill for the rest of the day – these image search tools are fun!